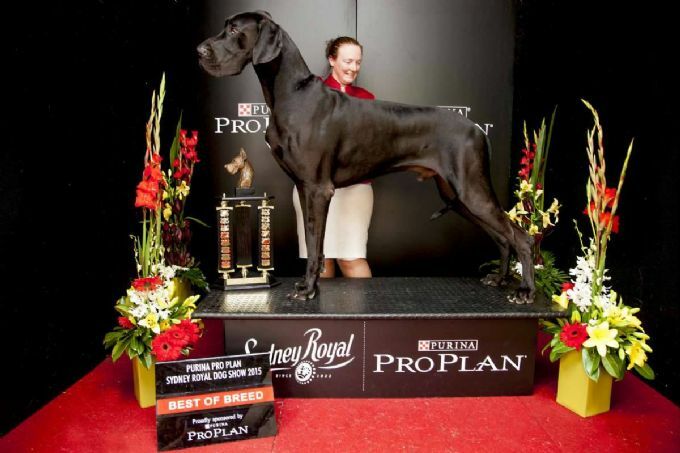 We have been involved in the show world since 1997, when I purchased my first Blue Great Dane, Todd. Our hobby breeding program however, is relatively young, with our first Pug litter born in 2010 and Great Dane litter in 2011. Todd later went on to become my first Champion. In the years before this I had several Great Danes as pets, in all colours. However, the biggest influence in my love of Black Great Danes was Charlie, a gorgeous Black Girl who was with us for 13 years. We have titled Great Danes in all colours, except Brindle, which is on the to do list :) When selecting dogs for our breeding program, Conformation, Health & Temperament are always No. 1. Pugs came into our lives in 1997 with the addition of Chester (Gailyn Court Jester). Chester was a Multi Best in Group, Multi All Breeds Class in Show winner. He gained his Australian Champion title very quickly and we never expected to do so well in the show ring with our first pug. As they say it is hard to stop at one, so over the years we now share our lives with more beautiful pugs, both Black & Fawn. Our Pugs to this day are bred with the guidance of our mentor, Verna Wright of Gailyn Pugs. We do not breed often, and only when we are looking to add a new member to show team. Puppies are occasionally available to companion and show homes. Our dogs come from sound lines, both in mind & body. Temperament is very important to us, as all our dogs live as part of our family and we expect the same family environment for all our puppies. Our Dogs are health tested where necessary and our puppies come with full breeder support for their entire life. Feel free to contact us if you have any questions, or would like to chat about these wonderful breeds.